Nearly two-thirds of selective public institutions are enrolling fewer low-income students than they did in the late 1990s. At more than half of those universities (54 percent) the increase in affluent students came at the direct expense of low-income ones. That's what's revealed in the latest New America project to examine student mobility. The authors behind "Moving on Up?" found that institutions reduced their share of students from the bottom 40 percent of income (less than $37,000 in 2013 dollars) while increasing their share from the top 20 percent (those with yearly earnings from $110,000 to more than $3 million). Typical proportion of low-income students served by type of institution. Source: The Equality of Opportunity Project's Mobility Report Cards. As a blog article by Editor Stephen Burd explained, the report tapped findings from the Equality of Opportunity Project, released in January as part of a study looking at the role colleges play in helping low-income students gain economic mobility. That project used data from the U.S. Department of Education as well as anonymized tax returns from the U.S. Treasury Department, which researchers could link to college attendance records. Combined, those two sources provided information on family earnings data for nearly every traditional student (those between 18 and 22 years old) who attended college between 1999 and 2013. When given the opportunity, low-income students are just as likely to succeed as their wealthier peers, even at selective colleges. Low-income students tend to do better when they attend more challenge colleges; undermatching appears to be a much bigger problem than overmatching. 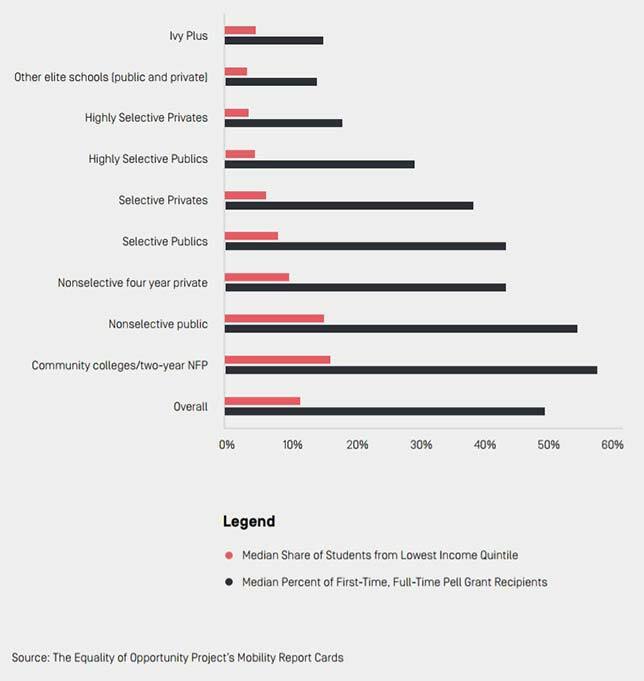 Low-income students generally end up going to schools — community colleges, regional state schools or nonselective or "barely selective" private nonprofit colleges — with the fewest resources. These are the same schools that generally have the worst outcomes, giving those students "far less chance of succeeding than their wealthier counterparts have." Given that many big-name public flagship and research universities are devoting ever larger amounts of institutional financial aid dollars to draw wealthy students, the report stated, "the colleges that offered many low-income students pathways to success are becoming less accessible over time." The same trend has surfaced in schools historically known for "lifting low-income and working-class students" into the middle class. The report singled out Stony Brook University as a prime example. Calling the Long Island institution a "social mobility superstar," the authors pointed out that it ranked third among thousands of colleges in helping students "get a leg up." Since the late 1990s, however, the proportion of Stony Brook students coming from families in the bottom 40 percent has dropped by 8.5 percentage points. Low-income students that made up a third of the class then now make up just a quarter. During the same period, the share of students coming from families in the top 20 percent of income has grown by about seven percentage points to almost 40 percent in the class of 2013. Most of that growth, according to the report, appears to be among students from families in the top 10 percent of the income scale, a segment whose share has grown from 16 percent in the class of 2002 to 22 percent in the class of 2013. Burd appears to lay much of the blame for this state of affairs on enrollment managers — the administrators and college consultants who develop the admissions and financial aid strategies used in recruiting students. As part of the strategy for fighting budget cuts and "seeking greater prestige," many of the selective publics have shifted their attention to wooing "wealthy out-of-state students and international students," leaving less room for in-state students with "less privileged backgrounds." In many cases universities are spending more than half of their institutional aid dollars for "non-need-based aid." That's true for the University of Alabama, the University of Wyoming and the University of Arkansas. The news wasn't all bad. As Burd wrote, about a fourth of selective public institutions increased the share of low-income students they serve, while reducing the proportion of wealthy students. Georgia State University was highlighted for increasing its share of low-income students to 31 percent and reducing its share of students from the top 20 percent of families to 26 percent, a drop of 8.5 percentage points. So were the University of Texas at Austin, which spent just 4 percent of its $54 million financial aid budget for non-need-based aid; the University of Nevada, where 12 percent of aid dollars was given to non-needy students; and the University of Michigan, where about a third of the aid budget was directed to those students. The report called for a better way of measuring a college's commitment to low-income students by getting more Pell Grant details — not just the percentage of grant recipients but more information about those who receive the maximum, the average and the minimum awards. The biggest challenge to change, the report concluded, is catching the attention of those in a position to revise laws and regulations. "We don't pretend we have all the answers. Plenty of higher education researchers and groups have offered their own proposals to make college more affordable and accessible for low-income students. But first federal and state policymakers need to take notice of the major problems we have highlighted," the authors wrote. "Are they listening?" The report is openly available from New America.